Well, it is a New Year and and new day and the second time in 2017 that I am sitting down as Vegan Annie (formerly Vegan Grammie Annie) to write an article for my little website about AR activism and all things vegan. It has been three years since this little idea of mine became a fledgling, “do it yourself” blog and then, with help from a web designer, a full fledged, albeit humble, website with tabs and drop down menus, glossy pics and the whole plant based enchilada. I started out with what I call 4 obligate subscribers who are actually close family members who did not dare NOT sign up – LOL!! But things have changed in the last three years and I now have a robust list of subscribers and people who comment regularly on my writings and musings about veganism, AR activism, the environment and plant based food. There is no question in my mind that in the three years I have been plugging along at this, the public interest in veganism and AR activism has grown and dare I say, flourished. AR activists like Anita Kranjc of the Toronto Save Movement are regularly making the mainstream news. 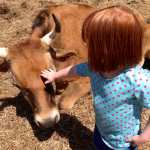 Social media has exploded with groups which inform about the benefits of veganism for the non human animals, the planet and by extension, humans. Innovative entrepreneurs are developing and marketing plant based foods with great success, even when faced with the wrath of established animal based industries and companies whose owners do not want to share words like “mayonnaise” and “meat” and “milk”, for fear of losing some of their market share. So, I find myself greatly encouraged and inspired to carry on looking at new ways of getting the word out, of being inclusive and supportive, of showing that plant based living and veganism is a good thing, a growing thing, a very relevant thing. In light of the budding inspiration I see around me, I have decided to add another feature to my website – REVIEWED RECIPES. There is a convenient drop down tab at the top of my homepage where these reviews will have a permanent home once they are published. Essentially, I will be sharing with you tips, switch ups and options that I recommend for some of the recipes I try. I have been cooking and baking for a few years (50 or so to be exact) and, although I have learned a thing or two, I still have flops and near misses. I recognize that many of us are not accustomed to cooking exclusively with plants and their offerings, so I want to make some of this easier and more accessible for everyone. I am aware that we live in a fast paced world and that we don’t always have a lot of time to set aside for cooking and even eating, so my goal is to help everyone simplify this process. For celebratory events that almost always revolve around eating, I will include some more complicated recipes. On special occasions, people seem to make or have more time for what francophones (French speaking people and their culture) in la Belle Province (Quebec, Canada) fondly refer to as “La Popote”. I enjoy a good smoothie. The jury is still out on whether or not they raise blood sugar as a result of the fiber in them being whirred up and broken, but I do use them in my daily food life. It is convenient. If I am in a rush and gotta get somewhere, as in late for an appointment. A smoothie takes 5 minutes to whir up and is highly portable for sipping while on the go. I love the creamy taste in a way that I never did when given traditional cow’s milk milkshakes as a child. Nut milks and soy milk for the win. I am a picky fruit eater. I love the taste of fruit, but will inspect it endlessly for soft spots, bruises, mushy feel or dry bits, and woody texture.If any of these imperfections are present, I am likely to discard the fruit after the first or second bite. If I have a smoothie in the morning, I am full until lunchtime and less likely to snack, a very real “thing” associated with regularly being at home during the day. Avocado – No need to peel. Using a sharp knife, cut in half around the center following the line of the pit. Remove the pit by scoring with the blade of a Chef’s Knife and pulling up on the handle of the knife until the pit pops out. Remove any blackish looking spots and scoop out the flesh with a spoon. Avocado can be quartered and frozen individually if it starts to get a little soft around the middle. We all know what that is like – getting soft around the middle on occasion. 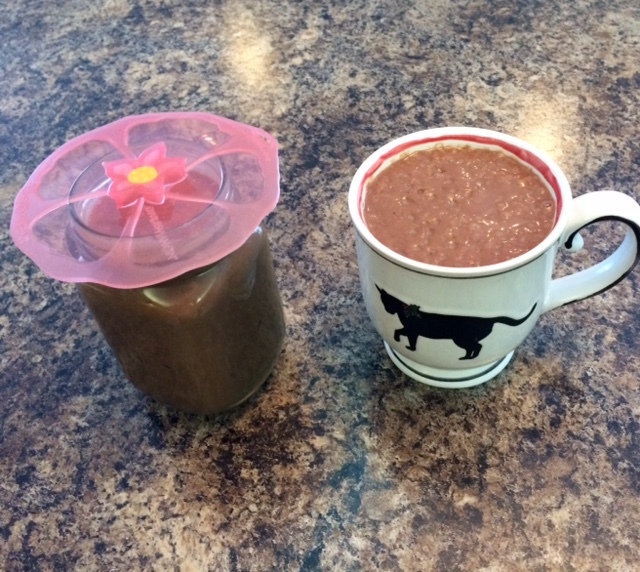 Dark Unsweetened Cocoa Powder – I use Raw, Organic, Fair Trade Cacao Powder. This cacao tends to be quite expensive, so use what the budget will allow. Agave Syrup(Nectar) – Replace the Agave with 3 or 4 dates. Dates are a preferable alternative because Agave, despite what you read, is a simple sugar, which health experts agree does not do a human body good. 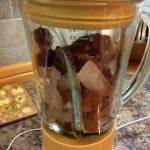 It takes a high powered blender to break down the dates, but if you do not have such a machine, the little bits that remain are tasty morsels that add to the smoothie experience. Medjool Dates are my favorite. They are soft and delectable, unlike Jaffa Dates which tend to be on the dry side. 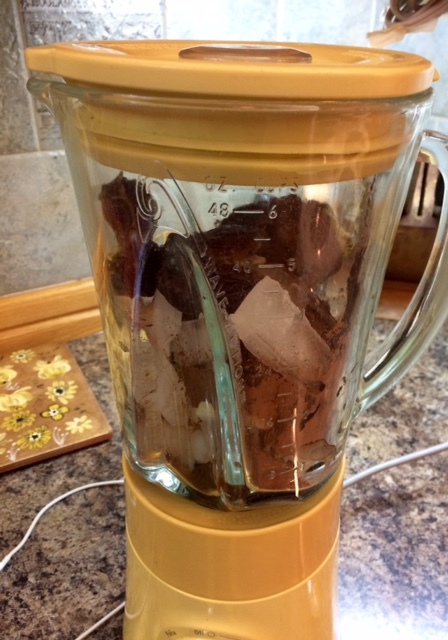 Frozen Banana – Does not need to be frozen. It is tough enough having all the ingredients we need on hand already in the appropriate state. Let’s not make making smoothies complicated. 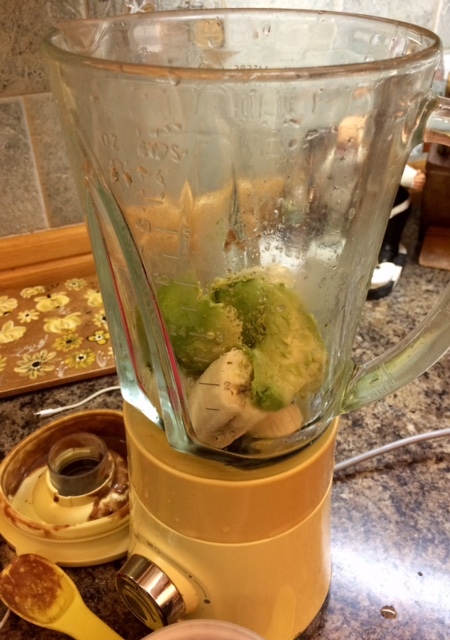 Add some extra ice if your banana is fresh and you like your smoothie really thick. Unsweetened Almond Milk – can be replaced with any other nut milk, soy milk or even water if you prefer. Extracts – For variety, add the flavor of the day, such as vanilla, coconut, almond, rum. Start with 1/2 tsp and adjust if needed. Very creamy and very thick result. Very filling and absolutely delicious. Left-unders (as my daughter used to call them) keep well in the fridge for a least a day. 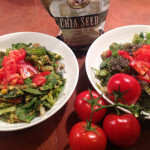 For added fiber and our ever needed friend, Omega 3, add 1 tsp of ground flax seed prior to hitting the “blend” button. I will have to try this. I am trying to incorporate more smoothies into my diet and am guilty of always making the same one. I have never had an avocado in a smoothie so that will be interesting. I will have to buy some agave nectar as I have never tried this before either. I usually make my own guacamole from avocados but have never used them for this. I know they are meant to be very good for you so I should try and eat more of them. I will let you know how it goes. I hope that you enjoy the smoothie when you get a chance to try it. Not everyone likes avocado in a smoothie, but I find that it gives it a lot of body to the mixture. I usually have a few 1/4’s in my freezer. I don’t often use any sweetener in my smoothies, but when I do, I opt for Medjool dates. I’d only put 1/2 an avocado in your smoothie. I also freeze mine as they last longer and sub for the ice. Welcome to my website and thank you for your suggestion. Reducing the avocado definitely could work. I also freeze avocado in quarters for use in smoothies. It is a neat little trick. 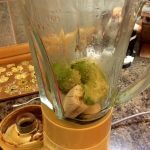 I tried this recipe with fresh and frozen avocado and extra ice and liquid is definitely required if the avocado is frozen, unless we want to start eating our smoothies with a spoon – which also could work. LOL! I appreciate the little hearts. Back at ya’, friend!